St.Lawrence Rehabilitation Center recently celebrated 40 years of delivering restorative care to people in New Jersey, Pennsylvania and surrounding communities. St.Lawrence Rehabilitation Center recently celebrated 40 years of delivering restorative care to people in New Jersey, Pennsylvania and surrounding communities. 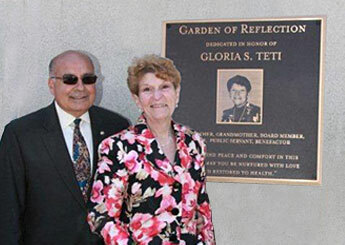 To commemorate this milestone, the Gloria S. Teti Garden of Reflection has been constructed at the main entrance of the center. It is a place where patients, families and friends can congregate to enjoy the beautiful outdoor surroundings. St. Lawrence Rehabilitation Center has been a treasure in the Central New Jersey community. Since 1971, a dedicated staff of professionals has restored health and mobility to over 100,000 people, providing quality care to both inpatients and outpatients. Because St. Lawrence is such a valued asset to the community and to those it serves, we offer you the opportunity to “Name a Brick” in the garden. “Bricks” may be purchased to honor or to memorialize a loved one, or in recognition of a special achievement or event. To purchase a brick, click here.